Best Make Makey Activities guaranteed to stimulate the imagination! Makey Makey is an invention kit aimed at getting kids to use their imagination and be an inventor! It’s gaining popularity just because of how much you can do with a single kit. All you need to get started is the Makey Makey board, alligator clips, a USB cable, and your imagination! But to get you started we have compiled some of our favorite Makey Makey games and a guide to get you started. 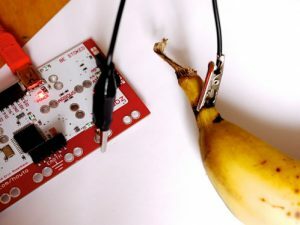 The sky is the limit when it comes to Makey Makey, it can be connected to virtually anything, as long as it can conduct a little bit of electricity; you can connect bananas and play the piano or connect alphabet soup and type a message. Even better, if you have already incorporated Drawido, Singing Fingers, or Scratch into the classroom Makey Makey can work alongside those too. You can approach using Makey Makey like a science lab. When using Makey Makey half of the fun is in the planning stage. You can make the projects as large or small as you want. Some projects can be modified to take up an entire room, others can be done on a small table. First, have the students brainstorm and come up with ideas on how they can tackle the project. Then have them mock up an example of the circuit and game. Finally, have them implement their ideas, test them and troubleshoot where necessary, and improve the designs as they go. Here are some ideas to get the creative juices flowing! For those students who are just learning the ins and outs of how electricity works you can start with a simple circuit project. Have the students make a simple circuit using an LED plugged into the Makey Makey board so they know when they have successfully completed the circuit. You can add to this by creating challenges for the students. See if they can complete a circuit with people incorporated into the loop, or create a piano keyboard by using foil wrapped popsicle sticks (you will need a separate application for this). You can add complexity by challenging the students to include parallel circuits too. There really is no limit to this simple project! 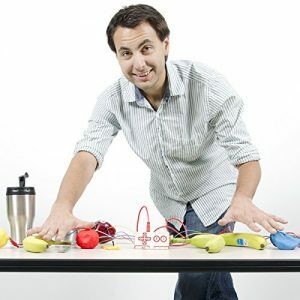 This is likely the activity (followed by a viral video) that put the Makey Makey on the map! To add some music to your lesson you can use the simple piano key application found on Makey Makey’s website here just plug in the Makey Makey with the USB cable and connect the key terminals available on the back of the Makey Makey board to essentially anything using a length of wire and alligator clips. You can play with lots of different foods (marshmallows, macaroni and cheese, shrimp), clays such as Play-Doh, foil or objects wrapped in foil (popsicle sticks work great for this). To get a more complex piano keyboard you can create your own (or have your students experiment with coding) by using Soundplant, Scratch (https://scratch.mit.edu/), or other similar programs. Again, you can make this project as complex as you want to cater to the ability and imagination of your students. 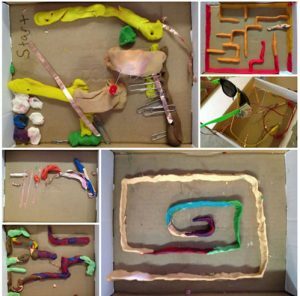 For a project that requires a little more know how you can have the students create a Makey Makey maze. Have the students sketch out the maze and determine the flow of electricity. The Play-Doh (or other conductive clay material) serves as the walls, and the students navigate the maze using magnets. The object is to make it through the maze without touching the magnet to the wall, if they do then the light goes on and they start over. This project can last several days as the students alter and reinvent their mazes as they refine their ideas- exactly what engineers do! They can even form groups and challenge other groups to see who can complete their maze the fastest. Bring this timeless arcade game into the classroom. This project is as simple as you want it to be, there is software freely available so you can just download, connect, and play. Or, the code can also be altered to add complexity and customize the game for your students to make it even more enticing. You connect the ‘holes’ that you will be whacking to anything that conducts electricity (bananas probably won’t hold up too well so potatoes are a better choice for this). As the mole comes up the student attempts to hit it by hitting the potato or other object that you have hooked up. By altering the code, you can change essentially every aspect of the game- even add pictures of the students as the ‘moles’ to make it more fun. Have the students add a little showmanship into their presentation by using Makey Makey to go to the next slide in their Powerpoint. You can let the students freely experiment with conductive materials in order to make their presentations more interactive. They can use conductive thread or other materials that turns them into wearable devices that are connect to the Makey Makey and hit the right arrow key when it’s time for their next slide. They can use things like cardboard bracelets wrapped in foil or gloves with conductive thread woven into them to complete the circuit and move on to the next slide. The possibilities are endless! No matter how you choose to incorporate Makey Makey into your lessons it will surely open their eyes to the magic of electricity and expand their imagination. The games and activities are so fun that students won’t even know that their learning. Makey Makey was among the top 10 toys & games we reviewed for the 10 best STEM toys. See the rest! This video is awesome… it will definitely want to make you order a Makey Makey now!